On Wednesday 20th of March people from Afghanistan, Iran, Tajikestan, Uzbekistan, Azerbaijan, Kazakhstan, parts of Turkey and many others will celebrate Nowruz. This celebration is most commonly known as the Persian New Year. 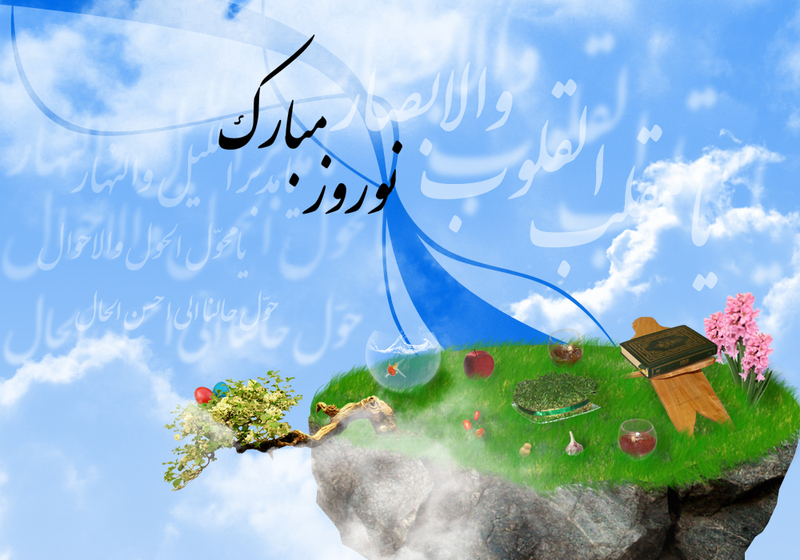 It marks the beginning of spring and the start of the year 1392 according to the Iranian Calendar. In connection to Nowruz, there are also two other festivities that are part of the New Years celebration. One is called “Chaharshanbe Suri” and it’s prior to Nowruz and the other is “Sizdah Bedar” which is after it. I will try to keep the explanation of this celebration simple, just to give you an idea of what the main aspects of Nowruz are. I will go through these three celebrations/ceremonies in the order that they take place. Chaharshanbe means Wednesday and Suri can be either interpreted as the word sour meaning feast or sorkhi meaning ruddiness. This festivity is also called the Festival of Fire. It takes place on the eve before Nowruz. During the evening people lit bonfires and jump over them while saying “zardi-ye man az to, sorkhi-ye to az man”. The meaning behind this sentence is stating that you want the fire to take your problems and give you warmth and energy in return. The fire is believed to bring enlightenment for the coming year. What some people also do during Chaharshanbe Suri is “Fal Gush”. Which means that what you hear in the conversations of others, you interpret as a sign for yourself. Some sort of fortune-telling. There’s also something which is similar to trick and treating, people wear disguises and go door to door. However they don’t get candy but Ajeel (dried fruits and roasted nuts) and a bucket of water. 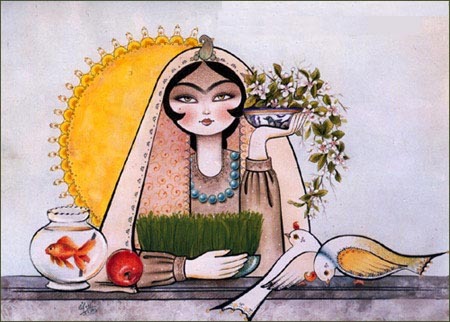 Nowruz remained a main celebration throughout the centuries, regardless of the different dynasties that were in power in the region at that time. It has been celebrated for at least 3,000 years. In Afghanistan, people prepare Haft Mewa (Seven Fruits) instead of Haft Sin which is more common in Iran. However in my household we do a mix of both. Haft Mewa is made from 7 different dried fruits, served in their own syrup. The dried fruits are: raisin, senjed , pistachio, hazelnut, prune, walnut and almond. Try to make this, I find it quite tasty and it’s healthy too. Nowruz has its traditional Haji Pirooz. He symbolizes the rebirth of the Sumerian god of sacrifice, Domuzi, who is killed at the end of each year and reborn at the beginning of the New Year. Wearing black make up and a red costume, Haji Pirooz sings and dances through the streets spreading good cheer and the news of the coming New Year. At the end of the celebrations on this day, the sabzeh grown for the Haft Sin is being thrown away. This to dispose of the bad luck that the sprouts symbolically have been collecting from the household during these past days. Well I will stop here. I think this should be enough to paint a general picture of Nowruz and the festivities surrounding this celebration. I want to wish my friends, family and everybody who celebrates Nowruz a great new year filled with joy. May your sorrows from last year stay in the past and hopefully you can start the new year fresh with positive vibes and new energy.